Alfa Romeo 116 series four cylinder car values have languished for a long, long time. Rust, notchy gear boxes, and tepid performance have sent many potential Alfa buyers over to the later GTV6 models as they generally are a more fun and compelling car to own. Today's feature car turns that notion on its head with it's tidy condition, being a rare model, awesome alloy wheels, mint interior (with the good dash layout), and later model twin spark engine swap. The euro twin spark four cylinder engine at 146hp is good for almost 50% more power than the stock spica injected engine and should make this car hustle in modern traffic. 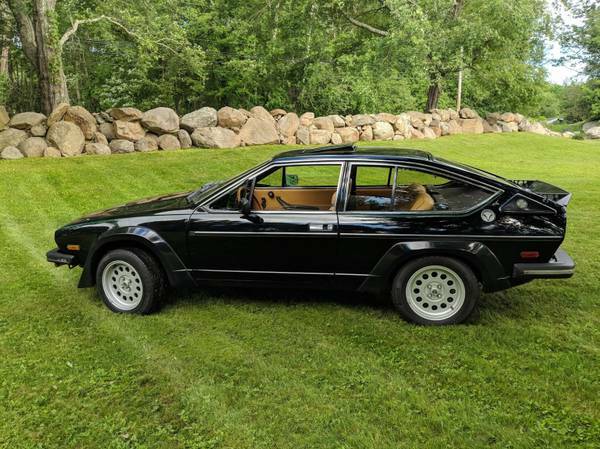 Find this 1979 Alfa Romeo Alfetta GTV for sale in Stonington, CT for $15,000 via craigslist. 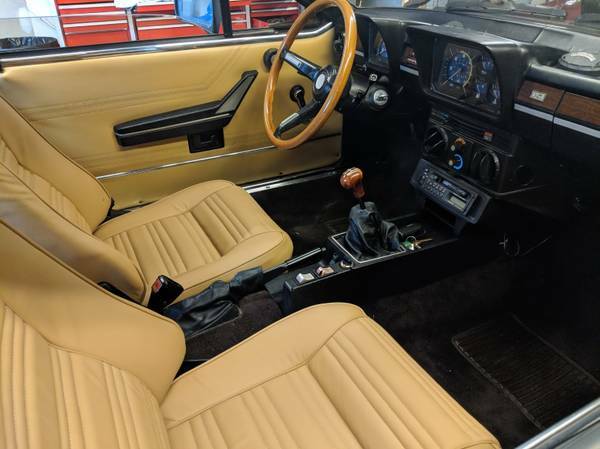 This GTV (alfetta) was delivered new as the "Velocissima Edition" These are very rare cars just google around for a while and see how many you find. The Velocissima was built only on the 1979 Sprint Veloce GTV, and only offered in black with tan leather interior. The Velocissima package consisted of a number of add on body modifications including a rear wing, plastic fender flares, 7" Ronal wheels (try to find those), yellow fog lights with "crash bars", front air dam splitter, rear air scoops, and rear sun shade over the back window inspired by (ie copied from) the Ferrari 308 (not on car now, but included with sale) Everything you see on the body of the car is correct and original. If you're looking at this ad, you know these cars RUST. This example is essentially rust free. I say "essentially" because the upper front shock mounts were rust repaired once (very common) and one drain hole in the spare well has slightly enlarged from rust. That's it, solid original rockers, quarters, and a very clean original undercarriage with no added undercoating or repairs. The Velocissima package was ALL COSMETIC, no performance or mechanical modifications were changed from the standard 1979 Sprint Veloce GTV so you got the standard relatively anemic 2.0 liter Spica injected motor from new. This car has been upgraded to a 1991 European Alfa 75 (Milano) twin spark 2.0. A much superior engine with 2 plugs per cylinder and Bosch (german) LH injection. Its a nice clean installation, no modifications to the car if you have to go back to orginal. The performance transforms the GTV into a real sports car. While doing the engine swap I rebuilt the entire driveshaft/clutch system, fresh giubos, driveshaft bearings, clutch bearings, clutch, etc. its silky smooth at revs unlike many of these. Shifts excellent, syncros work right, brakes are good, parking brake works, exhaust is correct and solid, tires are new, this car is ready to drive anywhere. The interior is excellent... Original Sprint Veloce only leather rear seat and side panels are excellent, carpet is excellent. Front seats have NEW correct leather ($$) to match, and matches perfectly. All instruments work, worst part on interior are 4 dash cracks. if you're serious about it you can find these dashboards in good condition. This was originally an AC car and the system is intact, just needs a new compressor mounted to the twin spark. Paint is about 7 out of 10. Has some original paint (on the sides) and some repainting (on the hood, roof, and hatch) there's a few nicks and scratches and few door ding dents. Wheels have excellent original paint on them. Car looks good from about 10 feet away and amazing when you fly by someone with that twin spark opened up. $15000 Might consider trades up or down for large SUV or long bed truck. 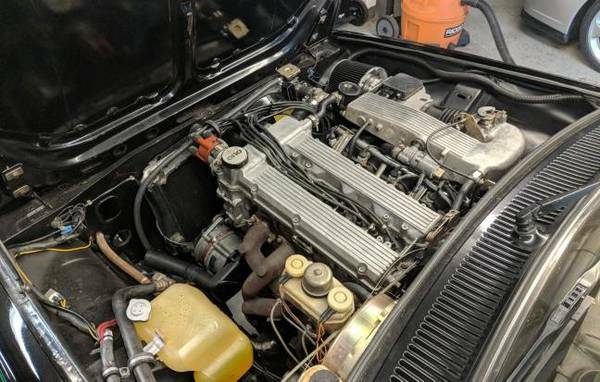 Yes, you can buy 4 cylinder 116 GTVs for $5000. It will be rotten, have a crunchy transmission, split seats, Spica headaches, and not be a rare edition Velocissima. Replies MUST include at least a first name and phone number. I will call you and we'll have a conversation about the car. I will not text or email. Replies without phone number will be ignored. There seems to be very little to nitpick in the listing. I would kill to hear a video clip of the car going through the gears on some back road driving. If I had the extra coin, I would not be typing about the car right now and would be signing over the title. Everything about the car seems to be tastefully done and just so right. You don't need to have a ton of power to drive like you hair is on fire and have no doubt this would be a joy to drive. The asking price is subjective, but when you consider what kind of money Porsche 912's and 914's are pulling these days this seems reasonable. I guess I was born in the wrong era. I'll never wrap my head around a late 70's/1980's Alfa product that commands more than 4 figures. I don't care what the market says. In agreement with you as far as Alfetta’s and S3 spiders, but I have no problem seeing GTV-6’s and Milano Verde’s with 4 figure asks.